Of course, Kristina decided she could get her own Party Plane in the works. 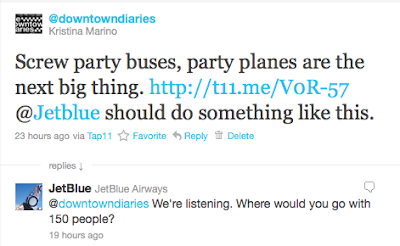 She tweeted to JetBlue for a Party Plane for 150 of NYC’s nightlife players to get to Coachella 2011. 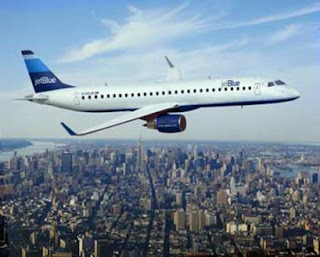 Every NYC party person, DJ, and promoter went bonkers over the possible idea and of course floods of tweets came in asking JetBlue to make this happen and to include them on this Party Plane. I was with Kristina at dinner with her freelance writing team as she filled us in on the email JetBlue sent her just hours after her tweet. Sure wouldn't want to be the staff on that plane. Its the first time I've ever heard this kind of thing. Thank you very much.